Krazy Krouse Kids: Fun Times! 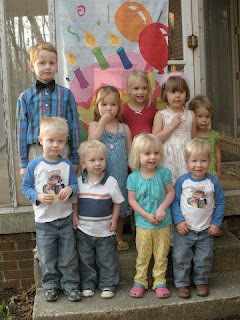 On Saturday we went to Hannah's 4th birthday party. 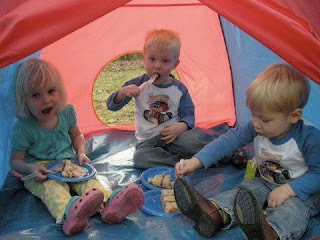 Here are some pictures that Julie took of the kids...thanks, Julie!! We all had a great time. 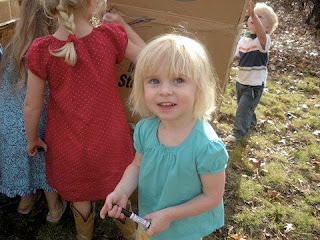 The older kids got to decorate the fort made of boxes with markers. They also colored the balloons with markers. This was all fun and games until Tucker got one of the balloons and rubbed it all over his face. He had purple marker all over him! 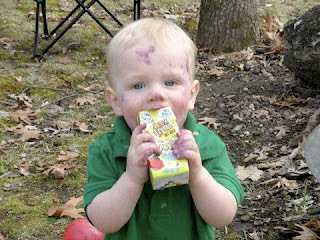 He also got apple juice from the juice box on his hands, face and hair. (Not to mention the baked beans in his hair.) Needless to say, it was bath time when we got home! 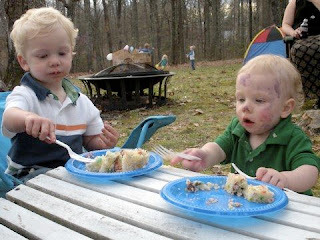 Oh my, Tucker...guess you're into face painting and didn't know it??? 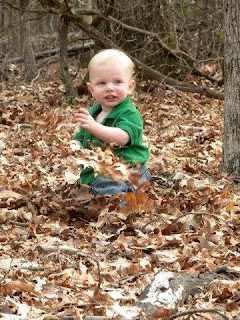 These photos will make fun memories! Enjoy that spring weather outside!